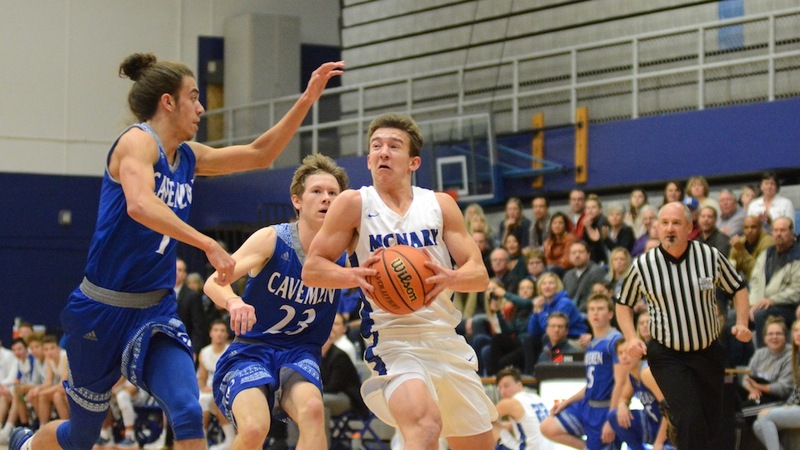 McNary boys basketball coach Ryan Kirch said Chandler Cavell and Lucas Garvey could have started on most teams last season. In the 2017-18 opener, the two McNary seniors began proving it as Cavell poured in 23 points and Garvey added 16 as the Celtics defeated Grants Pass 68-54 on Thursday, Nov. 30. Cavell scored the first basket of the season a little over a minute into the game but McNary fell behind 8-7 with two minutes remaining in the first quarter. The Celtics then got a spark form its bench as Griffin Oliveira knocked down a 3 and Boston Smith scored in the paint to give McNary the lead for good. Garvey made his second 3 of the game to stretch the lead to 27-19 with 3:43 remaining in the second quarter but Grants Pass kept attacking and the Celtics went into halftime with a narrow 32-28 advantage. Two quick baskets by Cavell and Garvey stretched the lead back to eight. “We really came together in some key moments and moved the ball around when we needed to,” Garvey said. McNary went into the fourth quarter up 53-43. The Celtics didn’t attempt a free throw in the first half. They went 11-for-14 from behind the line in the second. The Cavemen also shot more free throws in the second half, making 11 of 16 to remain in the game. Kirch played 10 different guys with eight getting in the scorer’s book. Senior guard Andrew Jones had eight points. Noah Hudkins added six points and eight rebounds in the post. The Celtics play at Oregon City on Tuesday, Dec. 5 at 7 p.m. and then open Greater Valley Conference play at home on Friday, Dec. 8 against West Albany at 5:45 p.m.